A public lecture by Professor Rory Fitzgerald, Director, European Social Survey, City, University of London and UWA Institute of Advanced Studies Visiting Fellow. In this public lecture Professor Rory Fitzgerald will first outline the challenges of cross-national measurement using social surveys and outline how the European Social Survey (ESS) has tried to address them. These include issues related to sampling, questionnaire design, translation, fieldwork and data processing amongst others. He will then use his own research to show how combining multiple waves of the ESS allowed an examination of the attitudes of migrants moving from Eastern to western Europe in their attitudes towards homosexuality. Do migrant attitudes change if they move from one context to another? In the final part of the lecture Professor Fitzgerald will give some examples of how the ESS has been used both in academia and beyond and will make the case for developing an Australian sister survey to the ESS. 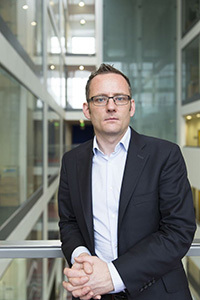 Professor Rory Fitzgerald became Director of the European Social Survey (ESS) in 2013 having been a Senior Research Fellow at City, University of London since 2004. In November 2013, the UK and 14 other European governments established the European Social Survey as a European Research Infrastructure Consortium (ESS ERIC) – an independent international research organisation hosted at City, University of London. ESS ERIC is one of the largest social science research infrastructures in the world. Rory oversees the ESS Core Scientific Team (CST) and the ESS National Coordinators' Forum. In addition to these committees he works closely with the General Assembly and the Scientific and Methods advisory boards. He has also written on substantive topics including attitudes of immigrants, attitudes towards climate change and understandings and evaluations of democracy. The ESS is a rigorous comparative biennial survey of changing attitudes and values in up to 34 European countries. With other members of the CST, he was awarded the Descartes Prize in 2005 for 'excellence in collaborative scientific research'. In 2016 the ESS was declared to be a landmark infrastructure by the European Strategy Forum for Research Infrastructures in Europe (ESFRI). There are just over 130,000 registered users of the ESS data, over 3500 publications using the data and many examples of non-academic impact from the findings of the survey.